Receivers set up, ready to launch! This was the second successful launch, albeit not receovery, of a CRAAG1 Tracker-based payload. 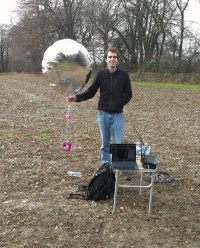 As before, one 94cm Qualatex Foil Balloon was used to lift the payload. This was very inflated and almost burst in the car when I switched the heater on! This launch was the first pico attempt to launch a camera. I chose the 808 due to it's low cost and weight. The battery would have lasted for approximately 40 minutes of the ascent. Unfortunately this payload ended up 15m high in a tree and has not yet been recovered. 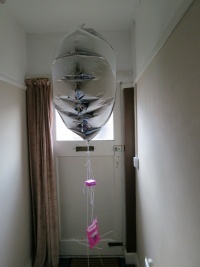 Inflated balloon plus payload (camera not in the box). The GPS Tracker had been slimmed down since the previous flight on 10th October by shortening wire lengths and using a lighter jiffy bag. The camera was mounted in a horizontal box made from foam packaging, stabilised from both top and bottom by string to each of the four corners. An additional loose 'tether' line was tied between the ring-hole on the camera and the drill holes on Upu's GPS Breakout board, to keep the camera attached to the tracker should the box-mount fail. 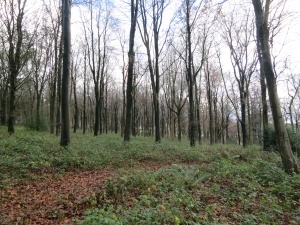 The balloon was launched from Beacon Hill, in the South Downs National Park in Hampshire. The field was extremely muddy, however the height of the hill proved to be a great advantage in tracking. This was extremely evident when the Southampton University ASTRA receiver almost 15 miles away picked up the payload as soon as the battery was inserted, while it was still tethered just 12 inches off the ground! Launch happened at 11:28am. The ascent rate was approximately 1.0 m/s. The balloon ascended almost straight-up due to the lack of wind, and I believe was barely above the trees before being received by another local habber. The balloon hit a cold, southwards-moving layer of air that took it south-east, opposite to predictions. This also cooled the payload down below freezing. Although I had not done any cold-testing; the GPS tracker was not affected and the camera should have been insulated enough to cope. 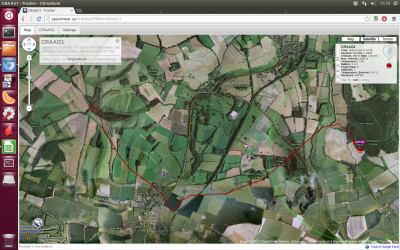 The payload then ascended out of the cold layer, warmed up and started heading north-east towards Petersfield. At the peak of the flight, even F5APQ located near Calais received a couple of the telemetry strings! Burst occurred at 3190m. It would appear from the descent rate and photos of the landed payload, that the balloon completely detached from the payload as in the previous flight. Due to the weight of the camera and the non-aerodynamic characteristics of the jiffy bag, the payload would have fallen head first with the tracker fluttering in the slipstream of the camera. This made the signal very difficult to receive, with only ASTRA, G8GTZ and myself from the launch site managing to get decoded strings. Balloon ascending just after launch. It was noticed that the balloon had landed at the edge of a rather large group of trees, and ASTRA was still able to decode it, meaning that it was some distance off the ground. 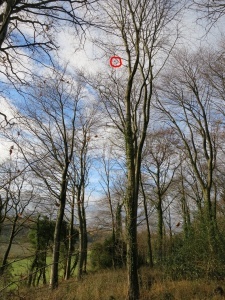 Access to the landing site was a 30 minute hike up a hill and across the wood through thick brambles, however we eventually found the payload.. 15m up in a tree. The tree was unclimbable and we found no way to retrieve either the camera or the GPS tracker. ASTRA received the radio signal for another 6 hours until the tracker battery went flat. 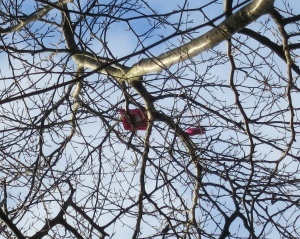 At the time of writing it is believed the payload is still in the tree, I will be visiting the site again before Christmas to see if the payload has fallen, due to wind or any other factor. Due to the remote nature of the site I don't think the payload will be found by any other persons, but if they do I am hoping they will call the phone number on the jiffy bag! 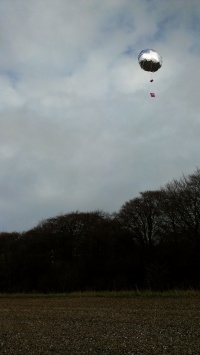 I have emailed the South Downs Park National Park Authority about how they would advise I go about retrieving the payload if it doesn't fall by itself. They replied informing me of the relevant landowner to contact before I hire in a Tree Surgeon, and wished me luck with the retrieval! Time to play 'Find the payload'.. This page was last modified on 7 December 2012, at 09:54.